It's a bit more than a foot long and fairly easy to build. You can download the pattern for free here. 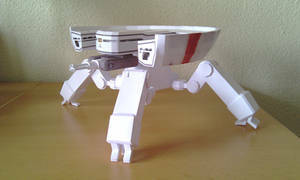 PSA: I've seen several people make this out of plain white printer paper. Do not do this. It will look terrible. Go to your local craft store and buy some colored cardstock instead. Hello, good morning and sorry to disturb, first of all congratulations for your work, I believe that this person is reselling his work without crediting his art, because it is noticeable that it is very similar to both works, thanks for the attention, again his work is incredible. I have printed out the template but it has no instructions on how to actually put it together! Help!!! Thank you very much for your gorgeous work!! Wow this is epic! The fact that you are giving this pattern out for free is awesome! Absolutely awesome - thank you for sharing the pattern! 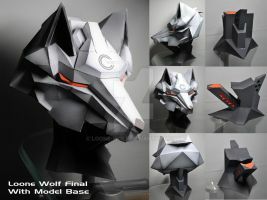 That's one scary wolf head. Thank you so much for sharing your inspiring work Gedelgo! Will you do the House Baratheon's Sigil now that you have done Stark' and Targaryen's? Hi Gedelgo, love your work. I made a colored version for printing if someone need it. Many thanks for your work. I downloaded your colored pattern and its very nice! Can you do this as well for the Dragon as well. Is just because I'm terrible in IT things. EDIT: Must be blind. Color can be found within the PDF itself. But for paperweight, any recommendation would be appreciated. Did you print on A4? Looks tiny because Adobe needs to shrink pages. So great! Thanks for sharing the pattern! There is a video on youtube which really helped. 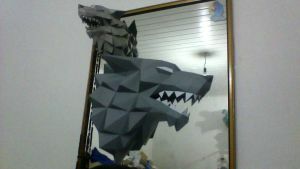 I can't post the link but if you search "Stark Wolf Papercraft(TUTORIAL)-Game of Thrones" you should find it. I could not have made this without it. Double sided sticky tape is a good hint. Once the piece was in place I lined the inside with box tape. The teeth are hard and I would recommend a practice run on paper to work out how to handle it before you use your good card. This is hard but it looks great when you are done. Hey, is the damaged pdf file (On the drive) the instructions? Or do you attach the paper with the number it says right on the edge? 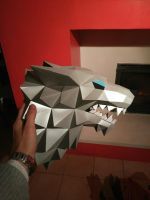 BTW: Also saw it in 9gag, really cool job!! Not sure what you mean by damaged. Use the pdo file if you're having trouble figuring out what goes where. I've seen this on 9gag, did some research and found you Amazing work! I've read in the comments that the markings on the pattern are on the outside, is that so? Yep, switch the valley and mountain folds to make it with the lines on the inside. tbh I don't know which one they are I printed it mirrored, but that might not have been necessary. It is already hanging on my wall and looks amazing! Awesome work! So,tell me how to download the PDF? Any way to send directions as a pdf file? Directions? You can follow the link in the description to get the pattern. Thank you, I've been looking for this for weeks.